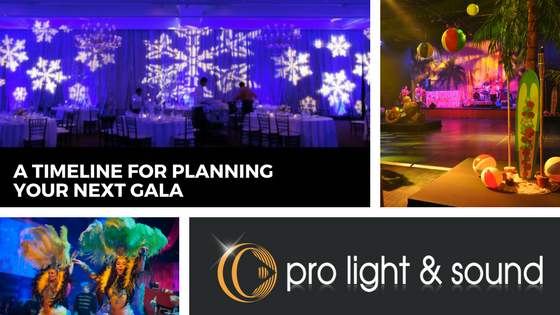 Are you in charge of planning your next gala? Galas tend to be large-scale events that require plenty of planning, and some professionals devote their whole careers to helping companies and organisations pull them off. If you’re planning a gala for your company, a charity or community group, there are many things to consider in the planning process. Follow this handy guide to ensure you’re on track at every step of the way. Set your budget and decide on the goal of your event. Determine the scope and scale of your event. Start looking for a suitable venue. Make sure it is large enough to comfortably host all your guests and has all the facilities you require, such as bathrooms, a kitchen, plenty of electrical outlets and so on. Select a theme. This should be something you can tailor your audio and visual services around. For example, a gala with an underwater theme will benefit from blue uplighting and murky green spotlights to create a sea-like effect, and you could even set up a projector and screen to display videos of underwater scenes. Meet with caterers to discuss your requirements and sample their products. Confirm your event lighting hire. This could include small-scale fairy lights and discreet washes of colour, or dramatic chandeliers and row upon row of exposed bulbs for more of a statement. Think about the entertainment you require at the gala. If you are planning on hiring a live band or musician, make sure you listen to them live to ensure they will be the right fit for your event. You should also consider what equipment they will require and whether you will need to hire audio equipment for them. Consider hiring speakers, microphones and other equipment the venue does not come equipped with. Even if you are not having live entertainment, you will still need this for making speeches, toasts and performing any auctions throughout the evening. Once you have organised your venue, engage an audiovisual stylist to help you make the best impact on your guests. Lighting, sound, projections, multi-media displays all have an impact and if done correctly can turn your gala into an unforgettable extrasensory experience.